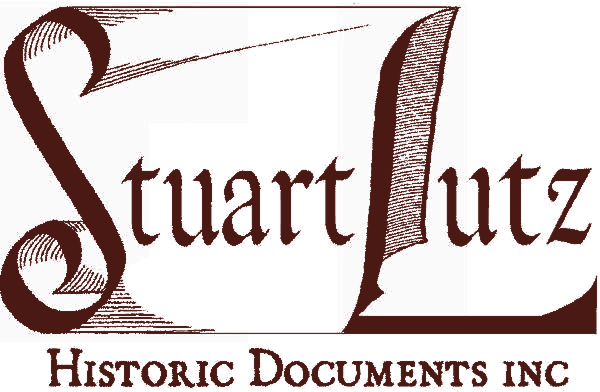 Stuart Lutz has been in the historic document and manuscript field for over a quarter century. During that time, he has sold the autographs and letters of all the Presidents, prominent Civil War and Revolutionary War figures, Signers of the Declaration of Independence, famous authors, well-known businessmen, important aviators and scientists, distinguished African-Americans and notable women. He also specializes in correspondence with outstanding content penned by ordinary people, such as a letter written from the Oregon Trail, Civil War battle letters written by soldiers, or a letter written from Honolulu after Pearl Harbor. Stuart is a member of the Professional Autograph Dealers Association, the Manuscript Society, the Antiquarian Booksellers Association of America, and the Ephemera Society. He is a Certified Member of the Appraisers Association of America, qualified in Historic Documents. He was the subject of a Time magazine article on the appraisal of their extensive archives. Stuart was also a Contributing Editor of Autograph Collector magazine, where he authored dozens of articles on the handwriting of famous people, such as Frank Lloyd Wright, Sigmund Freud, Susan B. Anthony and John Steinbeck. Stuart also wrote the first Bill Clinton handwriting study, identifying numerous machine signatures that were once thought to be genuine. He wrote the oral history book The Last Leaf: Voices Of History's Last-Known Survivors that contains thirty-nine interviews with the final eyewitness to important events; chapters include the last Civil War widows, Houdini's final stagehand, the last World War I soldier, the final living pitcher to surrender a home run to Babe Ruth and the last Lusitania passenger. He owns one of the largest archive of Vietnam War artifacts in private hands. Stuart has a B.A. in American history from The Johns Hopkins University. Below are links to Stuart's contributions which appeared in various autograph industry journals; selecting one will open a scanned version of the article.